take your poppy to work day. And in my work bag Poppy went. She’s had a big day, to say the least. … working from both the ball and at my standing desk. She updated appointments, reminders and due dates in my planner for me, and even managed to find time to take a nap in my chair! 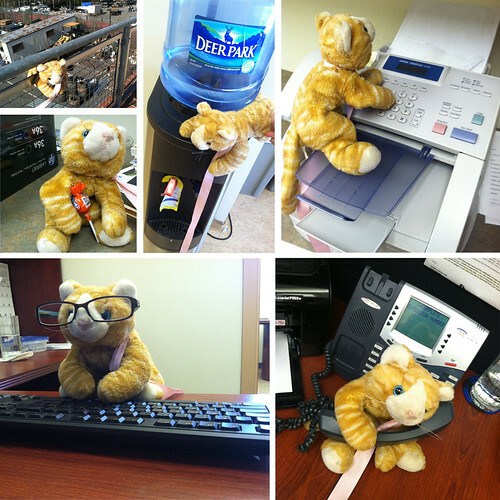 … working in various offices, waiting around for some water cooler talk (It never came, in case you were wondering. ), and checking out what was happening in the yard out back. She sent some faxes, replied to a few emails, and answered a few phone calls for my colleagues in need of help. Poppy even managed to grab a lollipop from the office next door! The next time “Take Your Poppy to Work Day” comes around, I’m sure she’ll be ready to go! 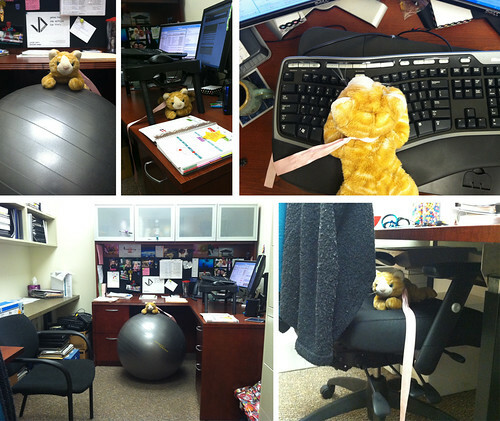 Note: No stuffed animals were harmed in the creation of this blog post. mom moment: macaroni & cheese. Just one of those mom moments that I’ve got to remember … there’s nothing quite as thrilling as being a parent! It was about 7:30 pm on Saturday night. We had finished dinner from Boston Market – turkey, mashed potatoes, and macaroni & cheese. In true toddler style, Lil ended up with a nice macaroni & cheese mustache, which Dada wiped away as he got her into her pajamas and ready for bed. The innocent mind of a child. Sometimes I wish I could bottle her up and keep her this way forever. I’m sure every parent has stories – times when they were utterly embarrassed by their children. I’m not talking about the misbehaving in a restaurant, baby screaming, or spit-up on your shoulder type of embarrassment. Nope, what I’m thinking of is much more fun embarrassing. I’m sure Lily has done some of these things already, but I’ve got the worst memory around and can’t think of any at the moment. Or perhaps I’m blocking the memories … who knows. If I think of any, I’ll add them here as an update! His question was followed by silence. I had to walk away; I was afraid of what would come next! I thought about turning around and telling them I was the mom of a 2-year-old, but I seriously don’t think I could have faced them without laughter. I can only imagine how that mom must have felt as the boy bellowed his question through the dairy department. While Lily has yet to ask me that question in particular, we have had some fun in public restrooms lately. Toddlers have no filter, so anything goes. I always laugh when she talks about what she’s done on the potty while there are other people in the restroom; so many times we’ve gotten a good chuckle! She also likes to make sounds; many times it echos, so she’ll shout, “Da do! Da do!” or “Ow! Ow! Ow!” Love it. Seriously, I have a hard time keeping my composure. It’s just so funny! About a month ago, we were in Target with my two sisters. Goose, Lily and I had gone into the bathroom, while A was at the Cafe getting a drink. Lil and I went into the larger stall, and Goose was two stalls to our right. Lily had gone potty and I got my chance next. It had been several hours since any of us had seen a toilet, so we had to go! Lil is usually pretty cooperative, so I’d never had any reason to worry. Frankly, I didn’t expect this evening to be any different. As soon as I sat down, she darted toward the stall door and opened it … to a bathroom of strangers! I have never laughed so hard! All I could do was yell through my laughter, “Oh my gosh, Lily! Close the door! Oh my gosh! Oh my gosh!” There were two people in the bathroom with us, and as I sat there on the toilet, stall door open, one of the women headed for the sink. I could see her in the mirror, and I think we were both totally embarrassed. Thankfully, she never looked up. I’m sure she knew what was going on. Yep, I know how that mom from Wegman’s feels … for sure. And honestly, I wouldn’t trade it for the world!!! My piece of advice for you? Take your toddler into the smaller stalls – they’re still close enough to grab them when they make a move for the stall door! Seriously? I have never, ever told her to say ‘cheese’ while taking a picture. I don’t tell anyone to say ‘cheese;’ it’s just not my style. I really don’t know where she gets this stuff from! Someone along the way must have told her to say ‘cheese,’ though I can’t figure out who. I’m pretty sure she made the association herself between ‘cheese’ going with the camera, and the camera going with the tripod. I’m blown away – the mind is such an amazing thing, and to watch it grow and develop is a gift. Shrek has officially taken the place of the news in our house. And cartoons. And prime time. And everything else you can possibly imagine. Lily loves all 4 Shrek movies. And we’re just thankful there are multiples we can use to mix things up a bit. It’s always on. It’s all she ever asks for anymore. So what happens after you watch something over and over and over? You start to learn the details – the order of scenes, key phrases, the characters. We’ve learned, through practice, that this even happens with little ones. We were watching Shrek 2 last night. The scene where Shrek and Donkey are walking through the woods began – Shrek accuses Donkey of purring, and Puss in Boots drops from a tree limb. He begins his attack on Shrek, and at the end of the attack, Donkey kicks Shrek to try to get rid of Puss in Boots. Justin and I almost died laughing when Lily said, exactly on time with Shrek, “No, you got them.” Neither of us helped her with that! Needless to say, we played that part about 25 times to hear her say it time and time again. Yep, parenting just plain rocks. That’s right, folks. It’s the most wonderful time of the year! Guess what I spotted earlier this afternoon? Let me give you a few hints. They’re oblong. They’re sweet. And I spotted them for the first time last year on 1/27 – and also blogged about it. 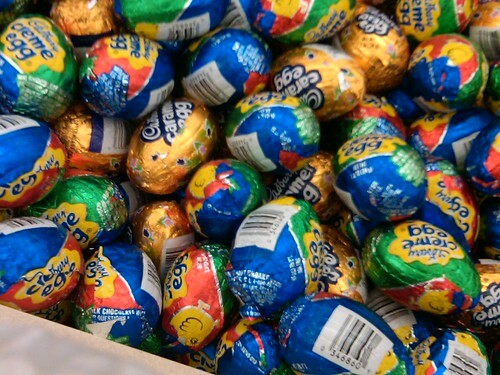 Yes, that’s right – it’s Cadbury Egg time!!! As tradition goes, I always buy 3 the first time I see them each season. (Not 1, not 2, but 3. 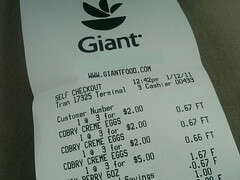 I have a thing for odd numbers, and 1 just isn’t enough. I suppose I could go for 5, but that might be pushing it. Besides, they’re typically 3/$2.) Well, today was that day! I’m so stinkin’ excited to bite into my first one. It might be the end of this week before that happens as my insides are still recovering from the stomach flu, but I’m just so happy!